A to Z Guide for a perfect resume writing literature. Many college students during their final year studies have been into resume writing because to search for a job. In this competitive world, it is not so easy to get a job unless you have special skills and knowledge. Writing a resume is the first step in your job search and it is your duty to submit a perfect resume to the employer, interviewer or recruiter. This decides whether to select you for their company else it makes them reject your application. The employer or the interviewer or the recruiter may not know anything about you unless your resume speaks to them. Essentially, your resume is the first piece of information that creates a good impression on your character and behavior. Let us see the perfect resume writing procedures and the to do steps to be followed to produce an accomplished resume. 1.) What is a Resume? A Resume is a document that represents a concise compilation of your educational and professional experience. It also includes the various skills you possess that make you the right fit for the desired job. The Resume should be arguable and that it should tell the interviewer the reason to set you up to get an interview. In the current decade, there are millions of online jobs applications are pouring for an interview and it’s fairly common today. A poorly written will get lost in the sea of applicants and we will discuss how to come up with a perfect resume writing skill? 2.) Difference between a Resume and a CV? Many of us may hear the word, CV (Curriculum Vitae), which is totally different from the resume. The CV is simply an expansion of your resume which includes more pages than your resume writing prospect. It mainly focuses on your academic and professional establishments with detailed accomplishments particularly focusing on your education. Many people often make a mistake in understanding the difference between writing a CV and writing a resume. Writing a CV: It should be as long as more than 3 to 4 pages with a complete description of your educational and professional establishments. Writing a Resume: It is a short form your CV with 1 or 2 pages with just a summary of your skills, experience, and education. Let us discuss the various tips on writing a resume and the most important point is crisp, simple and concise in your resume writing. Try to make it more clear and mention only the important summary as far as possible. However, there is no particular length limit for your resume, there is a general thumb rule followed and which is limit your resume to 1 or 2 pages. An average time spent on reading your resume is about 6 seconds only and hence, it becomes necessary to convey complete information in less than 6 seconds. While writing a resume, be sure to mention your recent contact information that includes your residential address too. Don’t forget to mention your email address, phone number, and home address on your resume. This helps interviewer or recruiter to make a decision much easier. Include your street name, city, state and pin code to add more value to your resume. The location of this contact information is very much important and it should be at the top of your resume writing. Describing the total work experience is another important task in resume writing which includes all relevant paid work experience, internships etc. Do not include volunteer work or charity work as interviewer or recruiter doesn’t like this stuff on your resume. Use the adorable titles and sub-titles such as “Employment History”, “Work Experience”, and “Work History” etc. to reflect your experience. Also, mention some of your skills and expertise that helped the growth of your previous company or the work. Measurable accomplishments such as, “increased sales by 40%”, “improved production by 20%” etc. will do better and make your resume stand out of the crowd. It is necessary to describe your previous experience, but neither go a long way that will bore your interviewer or recruiter. Include the name of the company, role or designation, location of the job (city, state, country), employment period (in both months and years) on the resume. Write a short description and your technical skills, not more than 3 to 4 bullet points. This should be listed first above the “work experience” unless you are a recent college student. While writing a resume, mention your education in a revere chronological order, for an example, if you have master’s degree, then, list that degree first. Include your complete educational qualification so that it gives an idea about you to the interviewer or the recruiter. It is very important to include the dates in the education section such as year of graduation. It is also necessary to include the total marks you obtained during the corresponding course completion. You can also list all the awards, honors and certificate’s you received during your studies, which will add more value to your resume. Every employer will like to hire only the skilled employee or the person who deserves to learn the skills required. Hence, it plays an important role in getting you up to an interview. Your resume writing should be tailored to skills you have. It any necessity arises, write your skills in a separate section along with your expertise level if possible. This section does not have any greater influence on your resume however you can include this section under any necessary circumstances. List all the awards, medals, and honors if you feel it will add more compliment or value to your resume. 4.) What not to include in the Resume? So far we have learned what are all the important aspects to be added while writing a resume? Now let us read some of the section’s which are not often necessary, better, to not write in your resume. When you look at the most of the manual resume, you will find this section at the top of the resume. This section is somewhat antiquated because of the evolution of online applications that reaches interviewer or recruiter directly. There is no value in adding an objective statement instead you can consider adding a professional summary statement instead. This methodology will create a greater impression over you which will lead you to be a most desirable candidate to the company. This is also a least necessary section of the resume which occupies more space but can be saved by removing it. A potential employer will ask you for any reference if necessary later on the interview process but it’s not deemed to mention in the resume. Many candidates mention their behavioral mannerism such as, “hardworking”, “problem-solving”, “teamwork”, “positive attitude” etc. These accomplishments cannot be provable or quantifiable and therefore it is not necessary to add this section in resume writing. If you want, you can add your hard skills and then prove your soft skills later by working for the company you were selected. Many people have this doubt whether they should include their hobbies and the interest on their resume. There is no specific answer as you can either incorporate your hobbies and interest else you can hide in your resume writing. If the company you are approaching has the job highly correlated to your hobby, then you can give them their own section. In general, there is no greater value in showing your diverse interest unless it seems slightly necessary for the resume. 5.) What are the different Resume Formats? 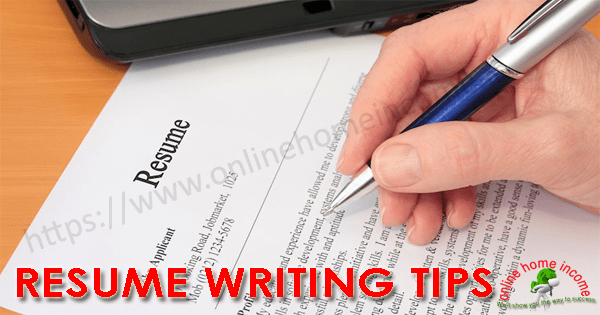 In general, resume writing is divided into three parts: Reverse chronological format, Functional / skill-based format, and the combination of the two. Depending on the use and the job type you are approaching determine the right resume format. 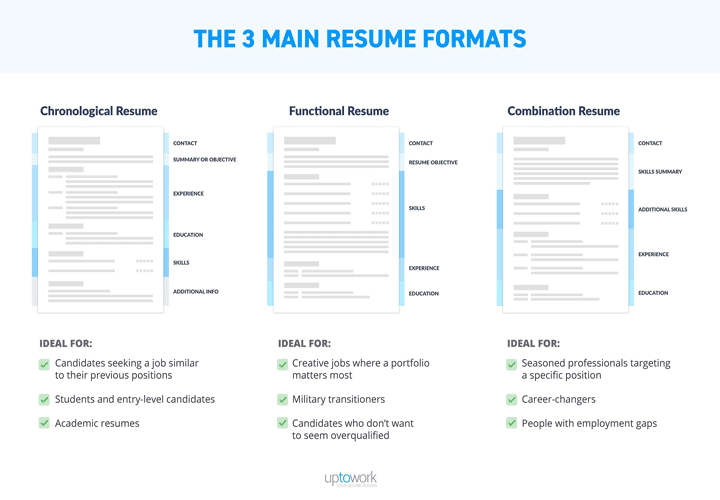 Let us discuss a bit detail about these three types of resume formats. Chronological Format: This kind of resume writing will showcase your previous work experience that is relevant to your current role. Functional/skill-based Format: This resume is suitable for the people who are looking for a career change. Mostly, recently graduated college students use this kind of resume format which highlights their skills and knowledge. Combination Resume Format: Always, a combination of anything is good, likewise combining chronological and functional resume is a very good choice. It gives a very clear picture of you to the employer or the interviewer or the recruiter. If you thoroughly read this article, you will come to understand the value of this point because one resume isn’t enough for varied job applications. This is a very bad approach and it reduces your chances of getting an interview. The main goal of every resume is to represent a candidate to the best as far as possible. Hence, it is, therefore, necessary to cover all your relevant skills, knowledge, experience and accomplishments in your resume writing. Mention proper educational degree and certifications, awards, conventions and other forms of rewards and mainly internships if any. Write complete contact information along with your full name, clear address, contact number and a professional email address. If you have any previous experience in the relevant job profile, highlight the same in your resume. Since, you are writing a resume for a particular job application, re-write by selecting only the required information. Avoid adding too many words in your content and write in a way that the employer can understand your ability, skill, and experience quickly. Be selective in including and excluding various attributes such as skills, knowledge, areas of expertise, and describing your experience. Do not overemphasize your skills or experience multiple times often it will bore your interviewer or recruiter. A typical resume should be two pages maximum and make sure all the essential information have been included. Yes, this will create more chances of getting job interviews and help to complete them successfully. Concentrate more on demonstrating or illustrating your achievements in your previous employment and not the responsibilities. Everyone is having responsibilities and the company does like only the person who successfully completes his/her responsibilities. The numbers and the data bring your work experience to life and it helps recruiters or interviewer to easily select you. Write a clear outline explaining your work, achievements and mainly the results you drove from the work. It is a very important thing to add the keywords that your employers are using in their job descriptions. The Interviewer or the recruiter wants to see whether you understand the lingo of their industry and mirrored their keywords. This methodology will help you resume stand out of the crowd and easily be seen by the hiring managers. It also creates a strong influence and thought about you that makes them think that you are the right deserved candidate for their job profile. This is the final task of resume writing. This includes correction of mistakes you made while writing the resume. Sometimes you may have chosen wrong choices of words to the smallest of typos. These tiny mistakes will totally disregard your resume. After you complete your resume writing, review multiple times by reading line-by-line, word-by-word etc. This helps you fix all grammatical errors and correct minor mistakes you may be missed while writing the resume. Get help from your friends, family member or someone else to read your resume before you submit the application form. Strong resume writing can make your job search easier and helps you easily get the interview to complete successfully. It helps you get one step closer to your dream job and with little efforts following all the advice in this article, you too can able to write a perfect resume. Always be sure to keep your resume less with all essential information included and therefore, this is what we call, “perfect resume writing”. Thank you for spending your time in reading this article, and if you found this article share with your friends.